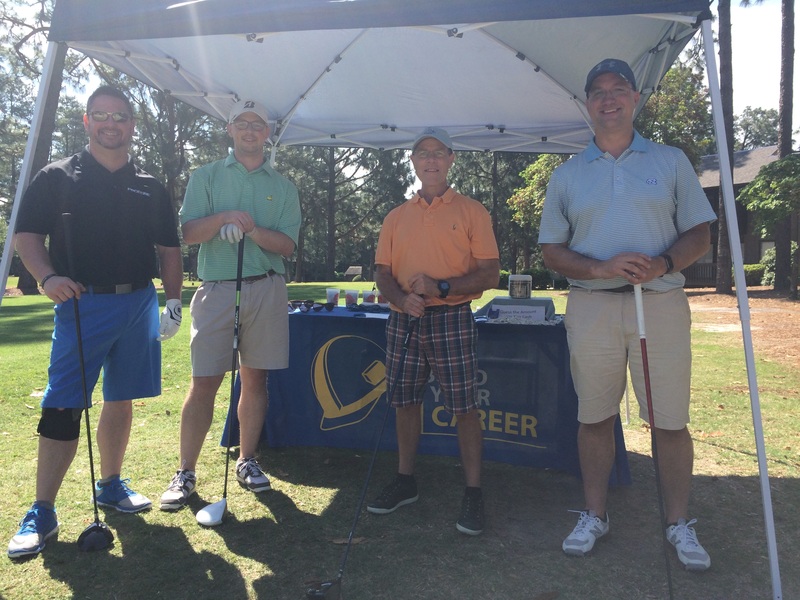 Home/BYC Ambassador Resources, CAGC Member Support, Fundraising, Networking, Workforce Development/BYC HOSTS MOST SUCCESSFUL FUNDRAISER TO DATE! 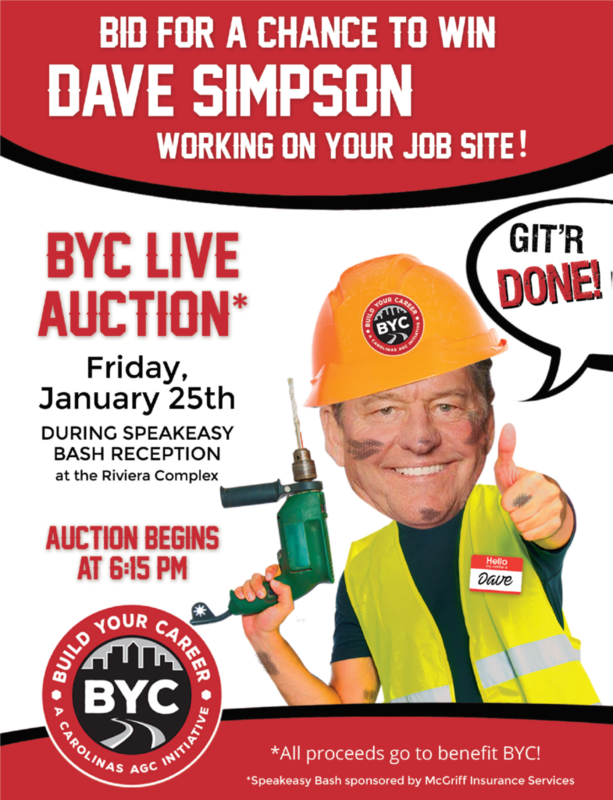 ﻿The 2019 CAGC Annual Convention “Build Your Career Live Auction Fundraiser” of our President & CEO, Dave Simpson! 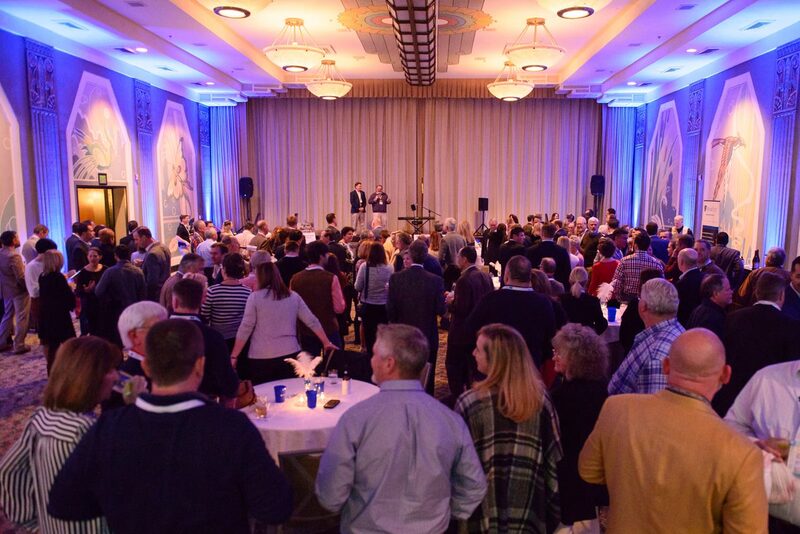 If you weren’t at the 98th Annual CAGC Convention down in Charleston earlier this year, then you truly missed out. 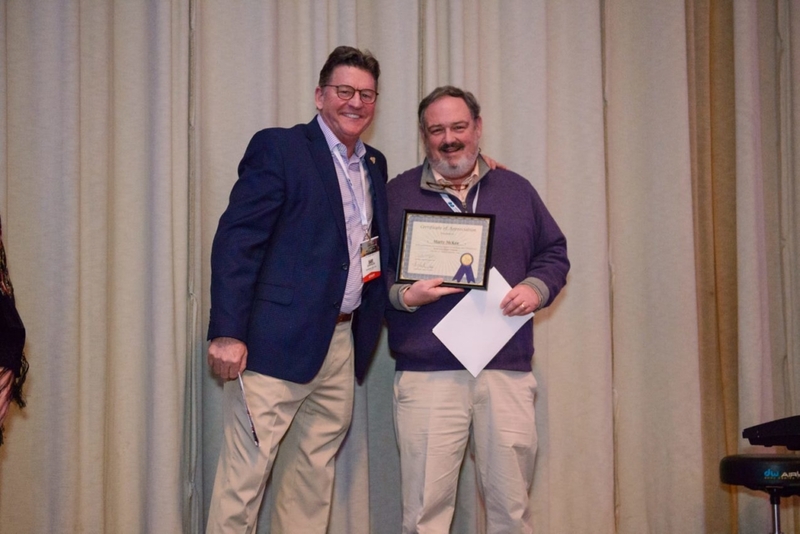 Dave Simpson, President & CEO of CAGC (and our fearless leader), was auctioned off to the highest bidders in a huge fundraising effort to benefit the Build Your Career workforce development initiative! The evening began with the help of Marty McKee, Vice President of King Asphalt and former CAGC Board of Directors Chair, acting as our auctioneer. The auction had three different levels that our attending members could bid on that night. Each “Dave Simpson auction item” included the services of Dave working on the winning bidder’s job site, BYC Director Tammy Ford conducting a workforce development seminar onsite for the winning bidder’s employees and TONS of marketing and PR! Our members really stepped up to the plate and knocked one out of the park for Build Your Career by bidding almost $20,000 to win Dave working on their job sites. Our first auction item was won by the team of R.E. Burns & Sons and Young & McQueen, as Kevin Burns and Sam Young pooled their resources together to drive up the winning bid of $5,000. Our second auction item was won by People Ready Skilled Trade staffing services, thanks to a $4,000 winning bid from Kevin Ponder, Director of Construction Services at People Ready. And the third auction item (the whole 9 yards package) was won by Keith Wayne of Wayne Brothers with a winning mega-bid of $10,000! Each live auction package included Dave Simpson working on the winning bidders job site and different layers of promotional marketing and heavy press coverage. 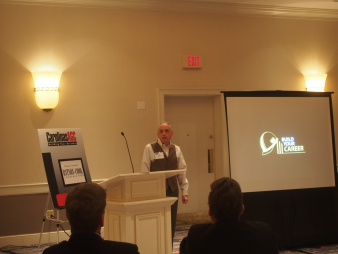 However, the level three package won by Wayne Brothers also includes them being named as the official Corporate sponsor for the new BYC marketing/rebranding campaign and one free registration to the CAGC Annual Summit being held in July at the Grove Park Inn in Asheville, NC. Wayne Brothers employees and various company representatives will also be featured in the new BYC promotional video—a marketing piece designed to target younger students and attract them to our industry, while also debunking negative societal myths associated with the construction and trade industry. “CAGC Construction worker” extraordinaire, Dave Simpson, promo event flyer…who wouldn’t want this sharp looking guy working on their job site? 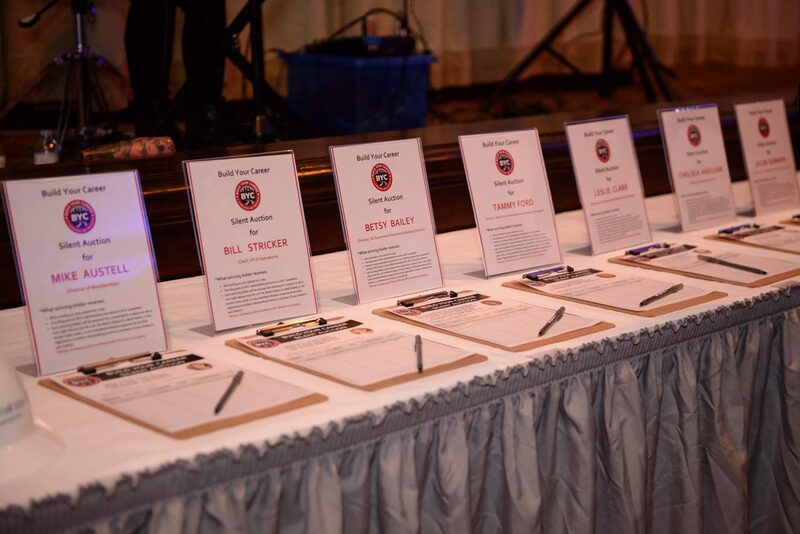 In addition to the live auction fundraiser, a silent auction of the remaining CAGC Staff members was also held over the course of the weekend. Convention attendees were able to place bids on their favorite CAGC Staffer with all proceeds also benefiting BYC. Included in the silent auction package was each participating CAGC Staff member working on the winning bidder’s job site for a day, heavy marketing and press coverage and entry into a raffle drawing. Mike Hall of Hall Contracting, the winning bidder of the Bill Stricker auction, was also the winner of the raffle—which included a one-night deluxe stay for two at the Westin Resort in Jekyll Island, Georgia, a Yeti bucket-style cooler, a Leica Geosystems handheld distance measurer and also one free registration to a District Luncheon or CAGC Networking Event of his choice. And to spice things up a bit, the auction package for Betsy Bailey, NC Building Division and Government Relations Director, and the package for Leslie Clark, SC Government Relations and Divisions Director, included both ladies conducting an educational seminar for the winning bidder’s Staff to educate them on the political climate in NC/SC and how to be an effective advocate for the construction industry. Charlie Wilson of C.T. Wilson was the winning bidder of the Betsy Bailey auction and Dean Wilson of Hood Construction was the winning bidder of the Leslie Clark auction. John Couture of Flatiron Construction Corp. was the winning bidder of the silent auction for BYC Director, Tammy Ford, which included Tammy conducting either a workforce development workshop or planning a unique construction awareness special event on behalf of Flatiron. In total, the silent auction successfully generated an additional $7501 to the benefit Build Your Career program! Thanks to our loyal and dedicated members, between the live auction of Dave Simpson and the silent auction of CAGC Staffers, BYC raised $26,501. And, if raising $26,501 wasn’t enough, we also had several attending CAGC members make personal and Corporate contributions to BYC totaling $35,525…for a whopping overall total of $62,026 in donations raised at this year’s Annual Convention!! This amount was more than double what was raised during the 2018 Convention. 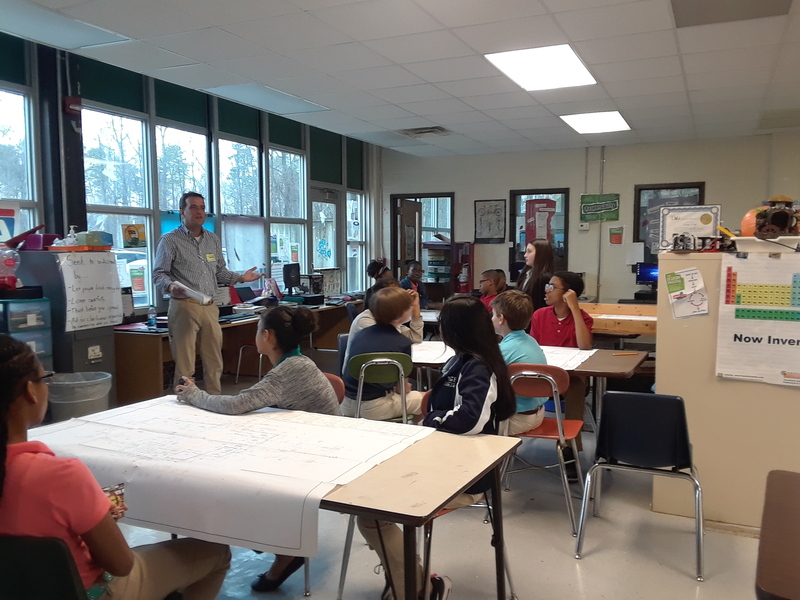 All proceeds generated will be used to purchase much-needed supplies and resources to equip our BYC Ambassadors with the tools and materials they need to effectively promote construction careers to students of all ages throughout the Carolinas. 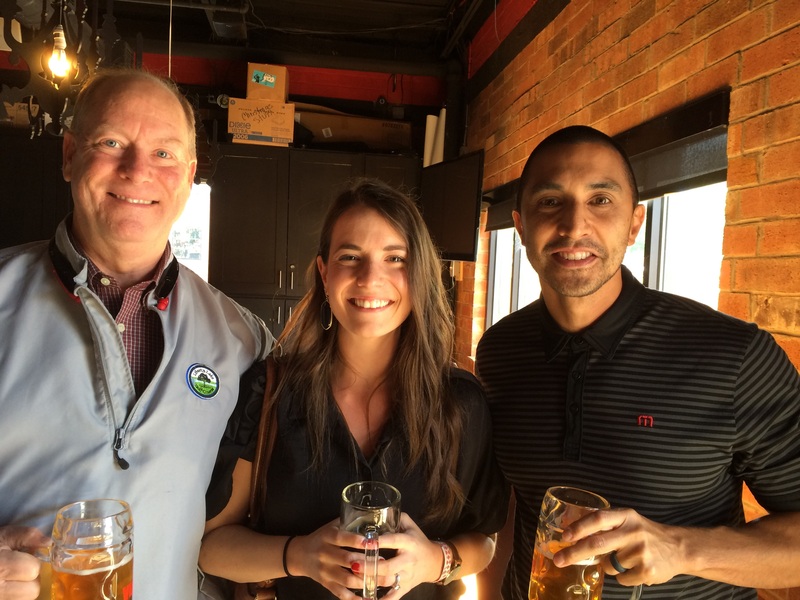 This was by far the most successful fundraising event in the history of Build Your Career and without the financial support of our members, this amazing (and FUN!) evening would have never been possible! We offer our most heartfelt thanks and sincere gratitude to each and every one of our CAGC member donors—your contributions will enable us to continue our efforts to put an end to the construction industry workforce shortage crisis here in the Carolinas. For more information on the CAGC Foundation’s Build Your Career workforce development initiative or to volunteer to be a BYC Ambassador, please visit our website at www.buildyourcareer.us/ or contact Program Director, Tammy Ford, via email at tford@carolinasagc.org or by phone at (704) 995-3901. To make a contribution to BYC, please visit our secure online donation portal, https://carolinasagc.givingfuel.com/byc-ambassador-fund.